Tracheostomy is a life-changing event. It affects the way a patient breathes, eats and speaks. Patients need reassurance, but mostly they need tracheostomy education — information on what they can expect to happen before and after a procedure. Respiratory specialists need to prepare to give basic tracheostomy education for patients. At the same time, they need to keep the information simple and clear. Here are some clear tips for basic tracheostomy education. to easily and safely supply air to the lungs. 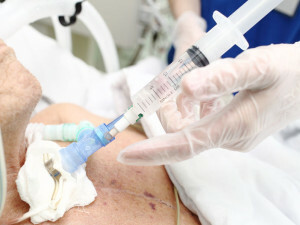 In order to allow air to get past the obstruction and into the lungs, surgeons open a secondary or bypass airway. When giving patients basic tracheostomy education, explain that the procedure involves making a horizontal incision in the front of the neck to expose the windpipe, or trachea. This opening is called a stoma. Next, the surgeon inserts a small tube, called a cannula, into the stoma to keep it open. Sometimes, it’s held in place with a neck strap. The procedure is usually done in an operating room under general anesthesia – which means the patient is asleep for the procedure. However, it can be done in a hospital room, as well. Understandably, a tracheostomy changes everything that a patient does in life: breathing, speaking, eating, drinking and sleeping. Tracheostomy education has to cover these basics of life. Stay hydrated — air patients breathe through a trach tube bypasses the nose and mouth, which provide moisture, warm and filtering. Patients need to drink plenty of fluids to keep their nasal and throat secretions thin. Start with thicker fluids, such as soups and non-alcholic, blended drinks. Over time, they can move to thinner fluids like water. Use a bedside humidifier at night. Wear a foam cover over the stoma, and moisten the foam with water to add more humidity. Squirt saline down the trachea several times d a day. Keep the tracheostomy tube it clean, and change it daily to prevent infection. Explain to patients that when they start to gag or pant, they need to, sit down and rest, breathe slowly and deeply. They should talk to their doctor about learning to relax. If you have a cuffed tube, ask your doctor whether you should deflate it before eating. Listen to your mom: sit up straight, eat slowly and chew your food thoroughly before swallowing. Eat plenty of fibre, such as whole grains, bran, fruits, vegetables and beans. If food gets into your airway, don’t panic. Try to suction the food through your trach tube. If this does not work, call 911.
you breathe something into the airway. You can always come to PEL/VIP for more tips on tracheostomy education in Chicago Illinois.